In order for original art, photographs, and film to be printed at Northlight Editions, they must first be converted to digital format. This process involves 3 steps. Note: Digital camera files from clients or digital files of artwork and from other software not produced in house are welcome for fine art printing at Northlight Editions. Original art and photographs will either be photographed in our studio using a high resolution 16 bit color multi-shot medium format digital camera back, scanned using a high resolution flatbed scanner or photographed on a table top copystand for delicate originals. Northlight Editions photographic studio can accommodate original art up to 60" x 60" height and width maximum. Please inquire about larger sized artwork. 35mm film is scanned with a high resolution 35mm film scanner. 4x5 and medium format film is scanned with a high resolution large format film scanner. Film format sizes larger than 4x5 and up to 8x10 are scanned with a twin lens high resolution flatbed scanner. Film sizes and glass plate negatives larger than 8x10 are scanned with a high resolution flatbed scanner. Please note that Northlight Editions does not provide restoration services on historic or color correction of age related damaged slides. Prints are made on 13", 17", 24" and 44" wide format Epson and Canon Image ProGraphic printers using both the 9 color Epson UltraChrome HDR K3 inks and the 12 color Canon Lucia pigment inks for excellent color, light fastness and black and white image quality. Custom icc profiles are made at Northlight Editions for our flatbed and film scanners and studio digital camera to ensure accurate color to known CIE color standards. Once the original art is in digital format, the files are carefully corrected and matched to the original art using Photoshop and other specialized software. Proof prints on the same media selected by the client are then made to match the original art. This 'file prep' and test printing work ensures a very close color match and feel to the original art. Final prints are then made to customer specifications as to size, media and borders. Print specifications and printing profiles used for each project are carefully documented and saved for future print runs. All master print files and 'BAT' bon à tirer or "good to pull" reproduction proof prints are archived at Northlight Editons in dark storage and are not for sale or distributed. A signed 'BAT' is required before printing can begin for clients who have proofed their work. Please see more information on proofing artwork in our Pricing section. Note that any changes from an existing signed 'BAT' will incur additional file prep charges. Print orders made against a previous signed 'BAT' will also be due and payable in full. This preserves the validity and contractual nature of the 'BAT' process for both parties. Northlight Editions uses a closed color management system to ensure accurate color matching of prints between subsequent print runs. Because of this, we do not guarantee color accuracy unless Northlight Editions files are printed at Northlight Editions. Northlight Editions guarantees all printing and file adjustment work as discussed and requested by the artist. Unless files are proofed at time of order, print returns will not be accepted after a 5 day period. We recommend all 'working' artists proof their work with Northlight Editions prior to making a final print order. To learn more about our proofing service for artists, please visit the Pricing section. Our policy is not to give out the master print files of work produced by Northlight Editions. This policy respects the trust between our artist clients and Northlight Editions and ensures that all authorized reproduction prints are made by Northlight Editions. All master print files are archived at Northlight Editions for future printing at no additional charge. Letter size 300dpi Jpegs for personal archiving, jpeg web files, and letter size 300dpi tiff files for brochures, books and other commercial purposes are available on request after an initial print order only. Digital Photography and scans of completed projects are archived at Northlight Editions at no additional charge. A proof or 'contact' sheet of archived files is available upon request. Northlight Editions files are created to produce optimum quality on our high resolution archival inkjet printers and may not match specific requirements of commercial printing. Northlight Editions does not work with third party or customer supplied print media. 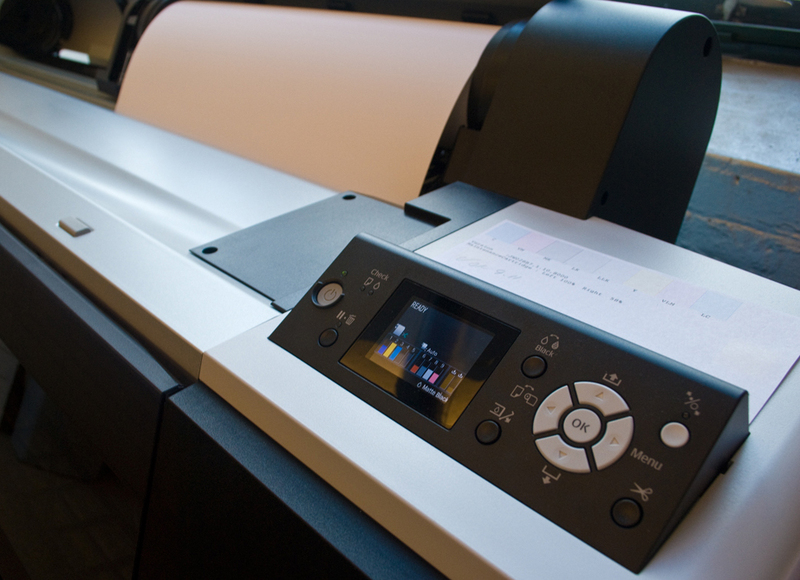 Only print media tested and approved by Northlight Editions will be printed on our printers using our archival inks. Digital Photography and scanning is done to support our printing service. Northlight Editions does not photograph or scan artwork or film originals on demand without a print order. Northlight Editions policy is to make prints only from scans and original digital captures of artwork produced in house. In those cases where the original artwork can not be photographed or scanned by Northlight Editions and files are submitted by the client, additional file prep fees may apply. Northlight Editions only makes reproduction and fine art prints from original artwork and digital files. Commercial offset prints and copy digital prints of artwork and other subject matter are not reproduced. Please inquire about technical requirements suitable for reproduction printing before sending or bringing in your files. Scans and original photographic captures of artwork produced in house remain the property of Northlight Editions. Turnaround times for reproduction work is normally 10 working days minimum and will depend on work in-house and will be quoted at time of order. We do not quote pricing on projects by phone or by e-mail. We also do not accept orders from internet files or new customer projects without an appointment and consultation at Northlight Editions. Please see information below for new and prospective customer guidelines. For those interested, please view our Pricing section and download a Pricing PDF. We do not accept 3rd Party billing. We invite all new and prospective customers to make an appointment to discuss project details, specifications, media choices and to review their files on our calibrated monitor. For smaller projects, pricing estimates can be determined at that time. For more involved projects, a PDF estimate will be sent by e-mail. Photographic Restoration and digital repair of historic photographs is not offered at Northlight Editions. We can refer to local and online services that may be of help with these kinds of projects. A 50% deposit is required on orders larger than $300. Thank you for choosing Northlight Editions.